An Autumn version of my "Sierra (2012)" render. I actually had to render this one twice (once with green leaves and once with fall colors) and combine them in Photoshop so I could vary the leaves on a "per-tree" basis. This is my favorite picture that you have ever done. As others have noted, it's not flawless, but I prefer to stand back and look at the perfect scene, rather than the small imperfect details. It speaks to me. I have several of your other wallpapers, and I keep circling back to this one. A bit harsh, but there is something weird about it. My initial reaction when in the browser was that it was beautiful, but in dual screen it looks weird. I think a big problem is the floating rocks - like gravity doesn't exist here...yet the water stays so still and down that the rocks don't have water marks. Not a 10 for reasons I cannot quite put my finger on. There is something not quite fully realized about the right half foreground. Your composition skills are on obvious display, but the product looks rushed. Wow. The way the sunlight filters; the stream flows (more precisely, the vegetation underwater is moved by the water flow); the trees and mountains rising in the background... one of my favorites. I love all of these! Always amazing! I just noticed your work-in-progress quote about revisiting some old projects and improving on them, and I'd like to again recommend revisiting an all-time-favorite classic! "Aftermath"
This image at a distance looks really amazing. The perfect landscape. But when you see it in real size its disappointing because it's not clear, very very grainy. just a little grain in my opinion would of been fine or none at all just like real life. but its still an AMAZING concept and execution by your part. great work. P.S I'm still hoping one day you make a pickle jar version of this but with no grain or very little, i think a lot of us would love to see that. thanks for your awesome work! So very grainy. Kind of disappointed in this one. Such a stunning idea, poor result. Awesome, but why does it look grainy, even the .PNG? Intentional canvas texture? I love the gardens so very much. "One of your best :)"
Guys, nothings perfect buts its pretty damn close!!. GREAT JOB RYAN!!!!! Fist off, I have to say that I love this piece. That being said, Im looking at the triple monitor version (5760x1200) and have noticed that there is something that bothers me. 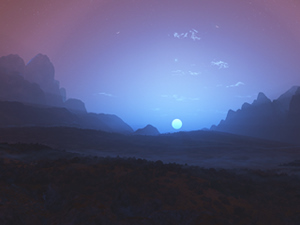 A few of the rocks on the far left and the far right side appear to be "floating". Was this intentional or just a weird error in rendering? Great idea to make the fall version! One of your best efforts. Awesome. Thank You. Dual Screen Please. New Halloween 2012 now please. I'm really digging this one! You have a life-long subscriber in me! This is absolutely amazing work, Ryan. This is probably one of the most beautiful scenes to date. I can't tell you how much I love it. Great work! Wonderful autumn mood and colours but a bit too grainy. The trees here look a little like the trees from "The Ride" (2009). It looks like a lower angled view from the scene. Wow... I've been a subscriber and admirer of your work for a number of years now and it just keeps getting better and better. You are really outdoing yourself. I'm a Vue XStream user myself but I can only worship from afar. This is pretty outstanding work. Congrats and keep it up. Very detailed work, Ryan. A beautiful scene. I absolutely love this rendoring. Please do a dual monitor version. I think it looks better on my Droid Bionic than it does on my monitor. Keep up the excellent work. I generally do like grain as it gives that nostalgic feel of a printed film photo. In this case, however, the image is too grainy, masking out too much detail from the treeline in the background. Otherwise, a very moody work - I love autumn! The upper half is beautiful, but the water looks off. Way too many straight lines in the reflections. I am impressed, but I agree with Walo that it still seems a bit too grainy. Hopefully the next version will be less grainy. The crashes during renders must be very annoying. Absolutely no medium is perfect. Oil and acrylic paints spill and smear. Water colors are even harder to control. This is great work. for lack of better words amassing. I love your autumn versions of images. :) Am eagerly anticipating the multi-screen version! Beautiful. One suggestion: change the angle of the sunlight, to make it distinct from the original. I think this is an awesome render but like some of your other recent works I think there's just too much grain in it. It degrades the quality too much. I can't wait until the Multi-Screens are complete!! I'd love to see an autumn version of the "Highland" series, too. That's one of my favorite series, and it's just not complete without autumn. 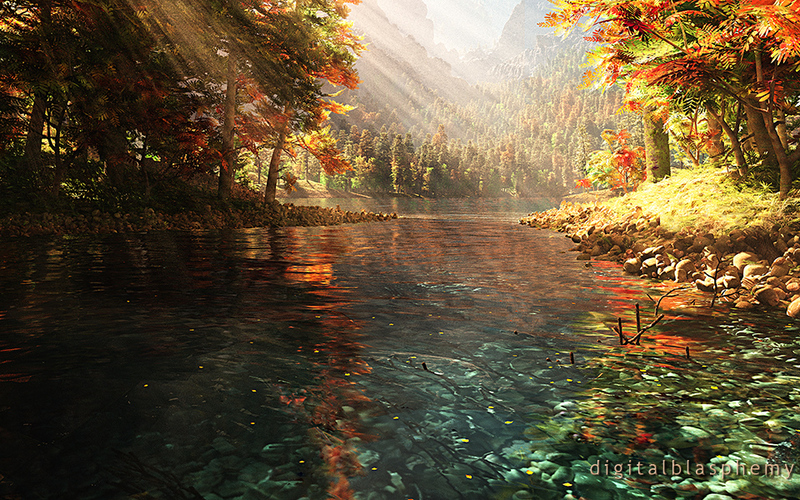 "Love it, water tones much better "
Best nature render to date, love it! I'm not a huge fan of the grain, but I love the accurate optical effects. The caustics and the extinction are top notch. Now that we've seen the Sierra valley in the fall from below (which looks amazing), I'd love to go back up to the cliff with the tree and see it from above. This is so much like a photograph, the realism is wonderful. The scene is a masterpiece of art. Thank You !! I gave the original a 9 and this blows it out of the water, well done. Probably best autumn scene ever. I'm afraid I can't find the right words in english to describe how beautiful this picture is. But rest assured, it is absolutely amazing! "Very nice choice of colours"
Nice one once again Ryan. Here in the Southern Hemisphere, spring in underway, and our trees are starting to bud. 6 months behind, or 6 months ahead, please take your pick! "Now We're In The Season"
I've been waiting on this to start set the autumn season mood. Very well done! The pressure is on now for something mind-blowing for Halloween! Ryan you so nailed it with this render. Autumn is my favorite time of year and you did such a great job with this one. Love it, love it, love it!!!! Amazing! Thanks for doing this one! I absolutely love the concept of making Sierra into an autumn scene, as those are generally my favourites of yours. However, Sierra was grainy, and this one is exceptionally grainy. Though it is probably more photorealistic with the grain, I prefer the fluid looks. Ryan, you took my favorite picture & did it in my favorite season. I'd give it a 10 if it were rendered a little closer to sundown. Still - a great piece! I love this. Can't wait for the multi-screen. The colors are beautiful. As for the graininess...it doesn't bother me. It's not very noticeable and I think it actually adds a bit of character to the piece. Wow. Just wow. Such pictures are the reason why I subscribed for lifetime. Thank you! Reminds me a bit of Indian Summer. Excellent work! Love the Fall! Favorite time of the year. thank you! Perhaps we could see the all autumn coloured scene that you used in the pickle jar? "Sierra Autumn vs. Sierra 8/10"
First, I do love it. Great follow on to the Sierra piece. Transition of the flowers on both banks is noted, as is some of the branches from the fallen tree resting in the water. A natural thing as some animal(s) may have broken them, or they broke from erosion. However my 8 comes from not only agreeing to other posts regarding the graininess, but also (& this is a big point) the fish in the lower right corner has not moved. And, it's hard to tell, but is there LESS snow on the mountains? All in all a great piece. I truly hope you are able re-render the image and send this one to the pickle jar. If no, it will still hold its own. Since I'm at it ... may I humbly suggest a hint of frost at the waters edge. That water must be mighty cold. This is a visually stunning piece, a great compliment to the original (spring?) piece. That being said, it looks like most of the trees are evergreens, and shouldn't be turning red. Also, the highlands in the Autumn are usually experiencing the lowest water levels of the year (snow at higher elevations has melted off), but the water actually looks a bit higher. Enough nit-picking, it really looks beautiful! Ryan, it's beautiful. It looks like an oil painting. This one crashed on me 2 or 3 times during the render process and I lost over a day of rendering each time. In the end I chose the "Final" render mode at 4000 x 2500 over the "Superior" mode at 3277 x 2048. I was only able to finish the render in "Final" mode, which is a bit grainier than I would like. I was hoping that I could eliminate most of it when I scaled the image down for the web, but I guess it is still evident. I was excited when you said you were working on an Autumn Sierra but I was a little disappointed when I saw it. It looks okay, but I think I would have preferred it without the green leaf mix. Also, the trees' reflections (especially in the middle) seem to be pure red while the trees are mostly green. The colors are wonderful, but the 2560x1600 looks super grainy, much more than normal. Is that an intentional artistic effect, or an artifact of the size? It almost looks pointilized. Ryan, this captures the mood of the season perfectly. Thank you! Got the water just right. Not too blue. Man you are on the way of reaching perfection. I was just going to put Sunburst Daily as my wallpaper and then I saw this. Now I have to figure out which to use! No fair! O_O perfect for this time of year! Here is my Autumn version of "Sierra". This is actually two renders (one with green leaves and one with Autumn colors) which I have layered in Photoshop so I could vary the leaves on a "per-tree" basis. It was time consuming but I hope the results were worth it!